Anna Airy (1882-1964) was an English oil painter, pastel artist and etcher. She was one of the first women officially commissioned as a war artist and was recognised as one of the leading women artists of her generation. Airy was born in Greenwich, London, the daughter of an engineer, Wilfrid Airy and Anna née Listing, and the granddaughter of the Astronomer Royal George Biddell Airy. Airy trained at the Slade School of Fine Art in London from 1899 to 1903, where she studied alongside William Orpen and Augustus John, and under Fred Brown, Henry Tonks and Philip Wilson Steer. 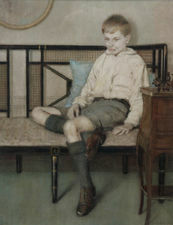 Airy won prizes at the Slade School for portrait, figure and other subjects including the Slade School Scholarship in 1902. She also won the Melville Nettleship Prize in 1900, 1901 and 1902. During World War I, Airy was given commissions in a number of factories and painted her canvases on site in often difficult and, sometimes, dangerous conditions. For example, while working at great speed to paint A Shell Forge at a National Projectile Factory, Hackney Marshes, London in an extremely hot environment, "the ground became so hot that her shoes were burnt off her feet". This painting was featured in an exhibition at the Imperial War Museum's 2011-2012 exhibition Women War Artists. In June 1918 the Munitions Committee of the Imperial War Museum, IWM. commissioned her to create four paintings representing typical scenes in four munitions factories. The Chilwell commission was replaced by a request for a painting of work at the Singer factory in Glasgow. Airy was also commissioned by the Women's Work Section of the IWM during the war. In 1917 she was commissioned by the Canadian War Memorials Fund; and in 1940 by the Ministry of Munitions. Airy was married to the artist Geoffrey Buckingham Pocock and for many years the couple lived at Haverstock Hill in Hampstead before moving to Playford near Ipswich. Airy's work was exhibited at the Royal Academy in 1905 and in each subsequent year there until 1956, her first one-woman exhibition having been held at the Carfax Gallery in 1908. Airy also exhibited at exhibitions at the Paris Salon and in Italy, Canada and in the United States. She has been represented in the British Museum, the Victoria and Albert Museum and the Imperial War Museum. Her work also appeared in the Art Gallery of New South Wales, Sydney, Australia as well as in Auckland, New Zealand, Vancouver and Ottawa in Canada and in the Corporation Art Galleries of Liverpool, Leeds, Huddersfield, Birkenhead, Blackpool, Rochdale, Ipswich, Doncaster, Lincoln, Harrogate, Paisley and Newport. Her etching Forerunners of Fruit (c.1925) is in the collection of the Art Gallery of New South Wales.